The October Long Weekend “ArtFest” was a great success with a steady stream of visitors coming to the factory to watch the silk being painted and to rummage through our “specials” bins. Our bags of Silk and Wool off cuts are always eagerly sought by crafty ladies keen to put some Brilliant colour into their creative projects. 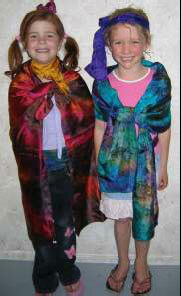 Notable among our visitors were the two “Rajastani Princess” pictured draped in silk. www.brilliantboutique.com is now fully operational with 110 full screen images of our Brilliant Wools and Silks. Special tribute must be paid to the two talented ladies responsible for creating and developing this showcase of our wearable art creations. To our web guru and designer Cathy of Cats Animation, www.catsanimation.com and to Linda our fashion designer, I say a big “Thank You” for the months of hard work and clever ideas. The finished product is simply outstanding. In January 2008 Australian Wool Innovation is staging a major promotion of Australian Merino Wool in New York in conjunction with Austrade and as part of G’Day USA celebrations. Our hand painted Merino Fine Knit garments are a worlds first and available exclusively from Brilliant Wool. We are coordinating our advertising and export promotions to complement the promotions of Australian Merino in the USA in January 2008. To Cat and to Linda I offer my sincere thank for a job well done creating a marketing platform which we will use to promote Australian Wool. Sign up now to have our free biannual newsletter emailed to your address.